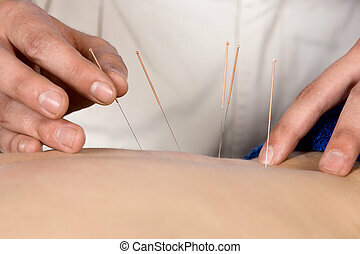 Physiotherapist doing accupuncture. 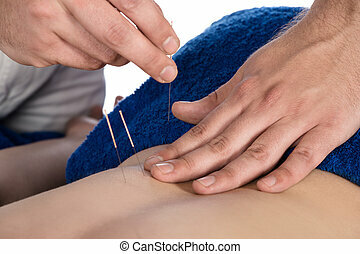 Adult male physiotherapist is doing acupuncture on the back of a female patient. patient is lying down on a bed and is covered with royal blue towels. Adult male physiotherapist strapping the knee of a male patient. 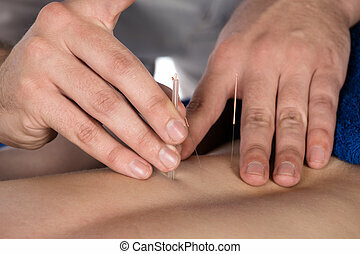 Adult male physiotherapist is assisting a female patient in rehabilitation exercises.